BACKGROUND AND PURPOSE: Subarachnoid hemorrhage (SAH) is a common and serious neurologic emergent condition. We tested the hypothesis that multimodality MR imaging depicts changes in cerebral blood flow SAH, before any surgical or endovascular intervention, and that the frequency of these changes increases with time after ictus. METHODS: We prospectively examined 37 patients with suspected SAH and three with symptoms of acute stroke but who subsequently had SAH. Routine CT and multimodality MR imaging were performed within 18 h of presentation. Standard MR imaging, diffusion-weighted MR imaging, time-of-flight MR angiography, and dynamic first-pass gadolinium-enhanced MR perfusion imaging were performed. 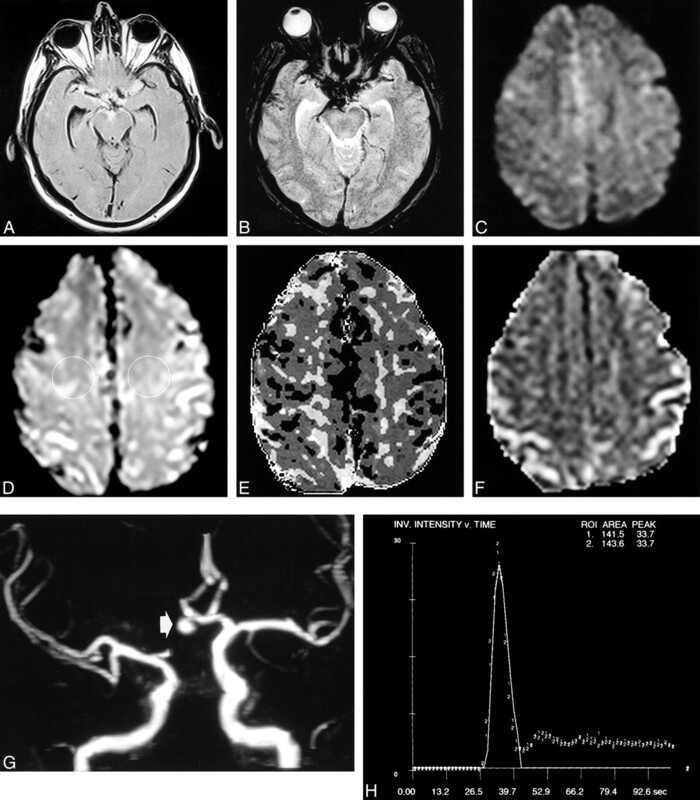 Images were reviewed for abnormalities in cerebral blood flow, ischemia, and infarction. Nine patients did not have SAH at CT and CSF investigations. Of 31 patients with proved SAH, 13 were examined during the acute stage (within 4 d of ictus) and 18, during the subacute stage (4–14 d after ictus). RESULTS: MR imaging showed alteration in cerebral blood flow parameters in 16 of 31 patients before surgery or endovascular treatment. The frequency of blood flow changes and associated complications increased with worsening clinical grade and increasing time after ictus. CONCLUSION: Multimodality MR imaging provides information not available from CT in patients with SAH. MR imaging shows oligemic and ischemic areas in SAH before surgery or endovascular treatment. MR imaging is a simple noninvasive method of assessing cerebral blood flow and its complications in SAH. It can be performed in a clinical environment. Subarachnoid hemorrhage (SAH) is a common cause for referral to a clinical neuroscience department, but patients are referred to a wide range of clinical specialists. If the patient survives the initial hemorrhage, he or she is at risk for further neurologic deficits due to ischemia produced by vasospasm (1) and further damage from subsequent bleeding. Typically, ischemia becomes symptomatic 5–7 d after the initial hemorrhage. Many patients are referred to specialty neuroscience centers immediately after ictus, but it is not unusual for patients to be referred later because either the patient did not seek medical advice or a delay occurred in obtaining a referral from the general wards. At this stage, the ischemic complications may be developing or may be already present. It is generally accepted that a “closed window,” corresponding to the period of maximal vasospasm, exists when clip placement is associated with poor outcome (2). This belief has led some neurosurgeons to delay definitive surgery if the patient is examined during the period when the frequency of vasospasm is greatest. A noninvasive, clinical method for determining alterations in cerebral blood flow and its sequelae would be a major advance in the treatment of patients with SAH. Recent advances in MR imaging make it well suited for this role, and in this article, we present our experience of using multimodality MR imaging in patients with SAH. Multimodality MR imaging consists of routine imaging, MR angiography, and diffusion and perfusion MR imaging. The aim of the study was to determine the frequency of ischemic complications in patients with SAH at different times after ictus, before any neurosurgical or endovascular intervention has been performed. We also correlated the findings of multimodality MR imaging with the patients' clinical grades. Patients with suspected SAH were recruited as they were referred to our regional neuroscience center. Also, patients were selected from among those presenting with symptoms suggestive of cerebral ischemia but who were subsequently determined to have had SAH. 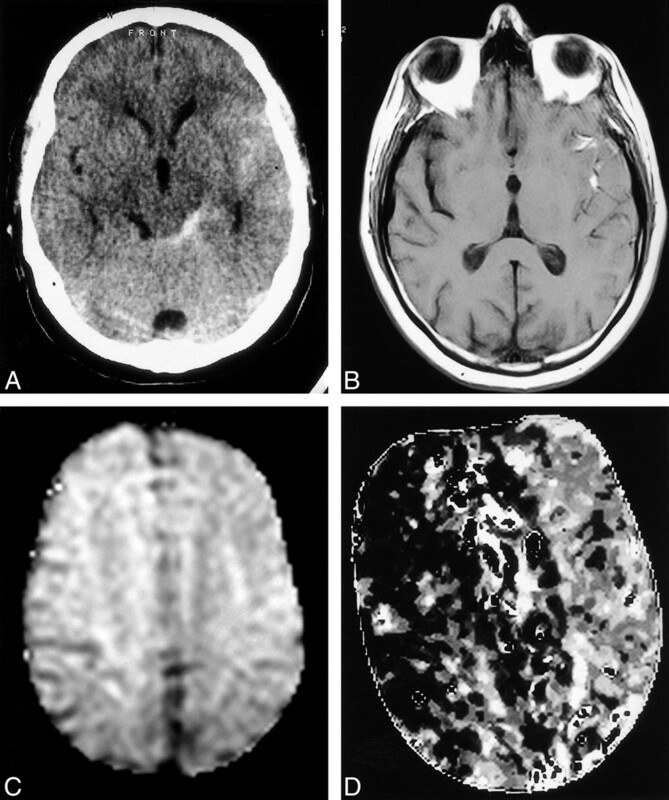 Routine CT was performed, and if CT scans did not show SAH, CSF was obtained to assess xanthochromia. MR imaging was performed within 18 h of presentation at our center by using a 1.5-T superconducting magnet with 27 mT/m gradients. Patients were screened for the usual MR imaging contraindications and were not included in the study if findings were positive. Sixty-two patients with suspected SAH presented during the course of this study, but only 43 underwent multimodality MR imaging. The reasons for not performing MR imaging in 22 cases were clinical instability (12 patients) or lack of access to the research MR imaging system on weekends (10 patients). Three additional patients were excluded because the clinical notes and/or CT records could not be reviewed. The median age of the 37 patients with suspected SAH included in this study was 45 y, with an interquartile range of 34–55 y and a range of 22–76 y. Of the 37 patients presenting with symptoms of SAH, definite SAH was confirmed in 28 on the basis of findings obtained at CT or examination of CSF. An additional three patients were included in the study. These were patients who presented with symptoms of ischemic stroke but who had xanthochromia, as revealed by examination of CSF and a history of sudden severe headache within the last 2 wk. 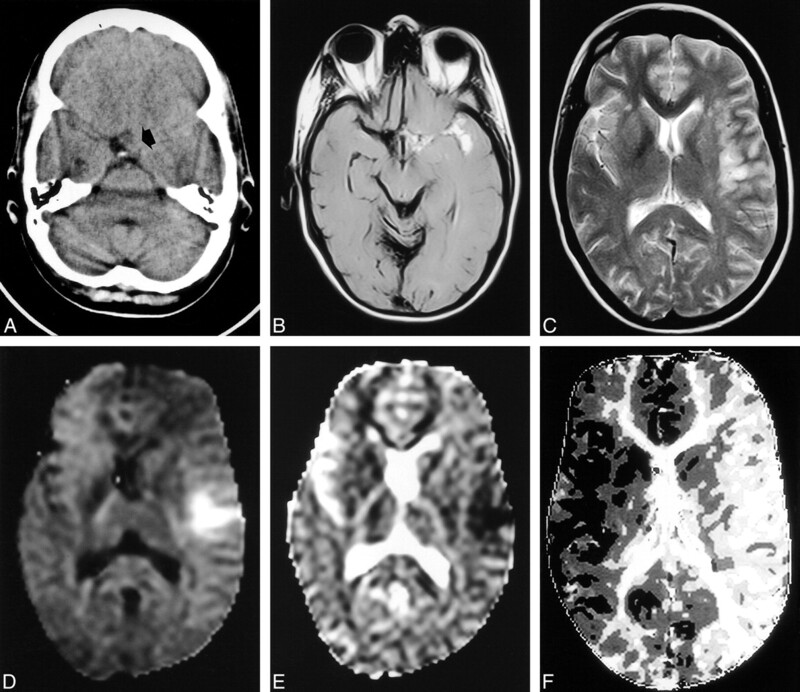 Multimodality MR imaging was performed in 40 patients (24 female and 16 male; nine without confirmed SAH, 28 with confirmed SAH and a typical history, and three with confirmed SAH who presented with symptoms of stroke). All MR imaging examinations were performed before catheter angiography. The nine patients (seven female and two male) who did not have SAH, as revealed at CT or CSF examination, were discharged with diagnoses of migraine (four patients), thunderclap headache (two patients), coital headache (two patients), or tension headache (one patient). All these patients had presented within 3 d of the suspected ictus. Case summaries of the 31 patients with confirmed SAH are presented in Table 1. At the time of imaging, the condition was grade 1 in 12 patients, grade 2 in 12 patients, and grade 3 in seven patients, according to the classification of the World Federation of Neurological Surgeons (3). Thirteen patients presented 0–3 d after ictus (acute SAH), and 18 presented within 4–14 d (subacute SAH). The MR examination consisted of routine multisequence imaging, 3D time-of-flight MR angiography, echo-planar diffusion-weighted imaging (b = 1000), apparent diffusion coefficient measurement, and dynamic gadolinium-enhanced perfusion imaging. Multisection perfusion imaging was performed during the bolus injection of 20 mL of dimeglumine gadopentetate acid at a rate of 5 mL/s. The full sequence information is shown in Table 2. Three neuroradiologists (P.D.G., C.A.J.R., N.H.) who had access to only the clinical information on the CT referral card and not that obtained at the CT itself independently reviewed the images. The reviewers were asked to comment specifically on areas of reduced cerebral blood flow and ischemia and/or infarction. Formal quantification of cerebral blood flow (in mL/mg/min) was not possible with the MR method used in this study because of the lack of reliable input and output functions (4). Therefore, indirect and relative measures of flow were measured. The two primary parameters used in this study were regional cerebral blood volume (rCBV) and regional time to peak (rTTP). rCBV was calculated from the area under the time-concentration curve, and rTTP was calculated as the time to reach maximum signal intensity change (Fig 1). These calculations were performed by using proprietary software. MR diffusion-weighted imaging is a sensitive method of showing cytotoxic edema, although debate regarding whether this represents irreversible ischemia exists (5). The development of T2 signal increase is thought to represent infarction in our cases. Therefore, three patterns of involvement are described, as follows. The first pattern is that of areas of reduced flow, as shown by an increased rTTP when compared with that on the opposite side or in adjacent vascular territory. Our early work has shown that normal variations are not greater than 1.5 s when compared with the other side (6). The second pattern is that of increased rTTP and areas of restricted diffusion (high signal intensity on diffusion-weighted images matched by areas of reduced apparent diffusion coefficients). The third pattern is that of areas of increased rTTP, restricted diffusion, and T2 prolongation. The nine patients who did not have SAH had normal MR images, that is, they had no evidence of hemorrhage, vascular abnormality, or alteration of cerebral blood flow (all three reviewers were in agreement). SAH was shown at CT in 26 (84%) of 31 cases and at MR imaging in 30 (97%) of 31 cases, and agreement between the reviewers regarding MR imaging results was substantial, with a κ value between 0.73 and 0.76. In the 31 cases of proved SAH, conventional angiography was not performed in three patients. In two cases, the reason was clinical deterioration and subsequent death, and in the other case, a diagnosis of sagittal sinus thrombosis had been made on the basis of MR imaging results, obviating conventional angiography. No vascular abnormality was found on conventional angiograms in six cases; ruptured arteriovenous malformations were present in three cases, and ruptured aneurysms were found in 19. All three reviewers correctly reported 18 of the 19 cases of confirmed ruptured aneurysms depicted on MR angiograms, and all reviewers missed the same aneurysm. With the definitions outlined in the Methods section, areas of altered cerebral blood flow were present in 16 (52%) of 31 cases of confirmed SAH. These were shown as areas of increased rTTP with little or no alteration in rCBV. The frequency and severity of flow changes increased with worsening World Federation of Neurological Surgeons grade. Blood flow changes were present in four (33%) of 12 patients with grade 1 conditions, seven (58%) of 12 with grade 2 conditions, and five (71%) of seven with grade 3 conditions. The frequency of flow changes and time after ictus were positively correlated; these findings are presented in Figure 1 and are summarized herein. At 0–1 d after the ictus, the frequency of flow changes was 0%, at 2–3 d, it was 22%; at 4–7 d, it was 64%; and at 8–14 d, it was 86%. 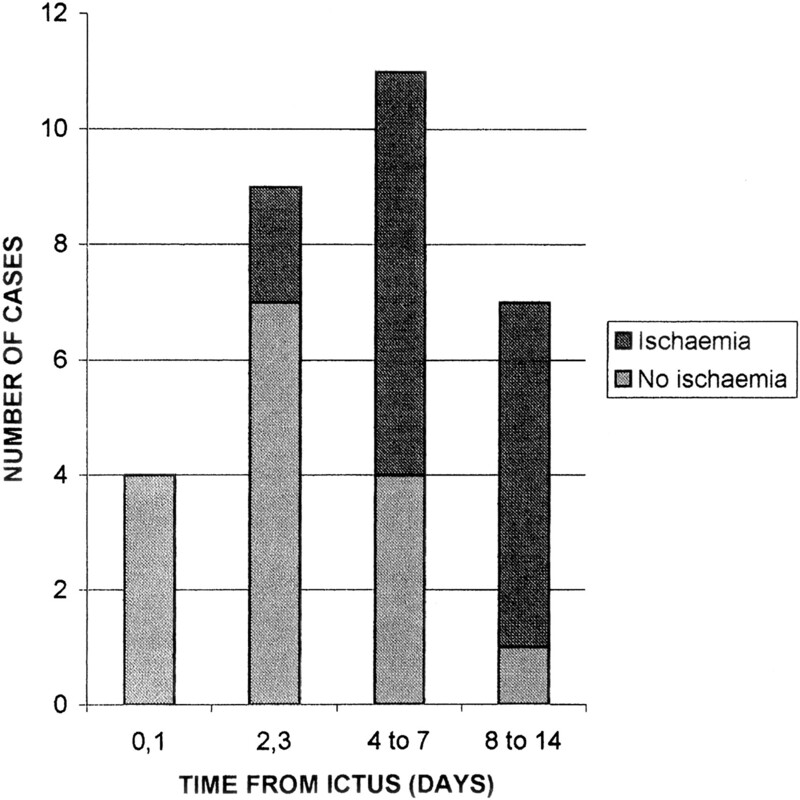 The severity of the changes associated with reduced blood flow varied with time after ictus. In cases of acute SAH, blood flow changes were shown in only two cases, neither of which had signs of ischemia on diffusion- or T2-weighted MR images. One was a case of sagittal sinus thrombosis in which ischemia from venous hypertension is expected. Therefore, only one ruptured aneurysm produced changes of cerebral blood flow within the first 4 days of ictus; this change was shown as increased rTTP on only perfusion-weighted images. Seven patients with early subacute SAH (4–7 d) had alterations of cerebral blood flow, and six of these had indicators of ischemia: one with diffusion abnormalities and five with diffusion and T2 abnormalities. Six patients with late subacute SAH (8–14 d) had blood flow changes, including diffusion and T2 abnormalities. None of the six cases of SAH with normal conventional angiograms had any indicators of cerebral blood flow changes, whereas 16 (73%) of 22 cases of SAH with a vascular abnormality had blood flow changes. Examples are shown in Figures 2–4. MR images obtained 1 d after SAH in patient 3 show acute SAH with no change in cerebral blood flow. Nonenhanced CT scan (not shown) showed a typical anterior circulation hemorrhage. A, Fast spin-echo fluid-attenuated inversion recovery (6000/96/1800 [TR/TE/TI]) MR image shows SAH in the basal cisterns as areas of high signal intensity. B, Field-echo T2*-weighted (588/30 [TR/TE]) MR image shows SAH in the basal cisterns as areas of low signal intensity. C, Diffusion-weighted image shows no restriction of diffusion. D, Perfusion image shows two selected regions of interest. E, Map of the time to peak shows normal, symmetric patterns. F, Map of the cerebral blood flow shows normal, symmetric patterns. G, Maximum intensity projection of the time-of-flight MR angiogram data shows an anterior communicating aneurysm (arrow). H, Plot of time versus signal change shows a symmetric curve. CT is widely accepted as the imaging method of choice for the examination of patients with SAH. The large cooperative aneurysm study published in 1983 showed that CT scans were positive for SAH in 96% of cases on the day of admission, in 95% on day 1, and in 74% on day 3 (7, 8). After 4 d, the probability of finding hemorrhage on CT scans starts to decrease rapidly: The probability is 85% at 5 d, 50% at 7 d, and 30% at 14 d. Detection of ischemic changes is important in the management of SAH, but routine CT is not sensitive in depicting early ischemia and/or infarction. MR imaging is more sensitive for this purpose, but its use has been limited because of perceived problems in imaging acutely ill patients and the lack of sensitivity for acute hemorrhage. In a previous study (9), we showed that MR imaging can be used safely and efficiently in acute neurologic and neurosurgical cases, and a number of recent articles (10–14) have shown that MR imaging reliably reveals SAH. The new MR imaging techniques of perfusion and diffusion imaging are exceptionally sensitive in showing early infarction in cases of ischemic stroke. Its value in acute hemorrhagic stroke has not been extensively investigated. Ischemia occurring after SAH usually is due to vasospasm, and it is responsible for a major proportion of delayed morbidity and mortality in patients with SAH. Investigators in one recent report (1) estimated that one third of the serious complications of SAH resulted from delayed ischemic neurologic deficits due to vasospasm. The initiating cause of vasospasm is thought to be a periarterial clot, but the biochemical mechanisms are unclear. Nitric oxide may be responsible for the normal tonic vasodilation of cerebral arteries, and it has been postulated that oxyhemoglobin in the subarachnoid space may interfere with the activity of nitric oxide. Other possibilities include free radical–based damage by means of lipid peroxidation and/or the release of endothelin from damaged vessels, which causes vasoconstriction by activating protein kinase C (1). It is interesting to note that, in our study, none of the six cases with proved SAH and negative angiograms had ischemic changes. Vasospasm usually becomes clinically apparent 5–7 d after ictus, and previous work with CT has shown that the risk of vasospasm is related to the volume of SAH and anatomic location (15). Sixty to seventy percent of patients with SAH have angiographic vasospasm 10–12 d after ictus; however, this finding does not correlate well with clinical vasospasm, probably because conventional angiography does not provide information regarding brain perfusion. Several techniques that can provide information regarding brain perfusion and/or blood flow are available. Transcranial Doppler sonography can be used, but it has several limitations (16). Single photon emission tomography and positron emission tomography have been used to assess vasospasm (17, 18), and xenon-enhanced CT can be used to obtain fully quantifiable blood flow data (19, 20). Reports concerning the use of diffusion and perfusion imaging in cases of SAH are beginning to appear in the literature (21, 22). Rordorf et al (21) reported the cases of six patients with vasospasm resulting from SAH and found many areas of perfusion alteration and ischemic regions. They found that the most useful MR perfusion indicators were the measures of times of bolus transit (mean transit time, rTTP), whereas the rCBV usually was normal. This finding was confirmed in our study, in which patients had significant rTTP delays but normal rCBV values. In our study, the 40 patients with suspected SAH were selected from our routine practice in a regional neuroscience center. They are part of a subgroup of 65 consecutive patients with possible SAH who were referred to our center. Twenty-two patients could not undergo MR imaging because their conditions were of poor grade and they were considered to be too ill by the referring clinicians or because they presented on weekends when the research MR imaging facility was not available. Patients with SAH whose conditions are of good grade, however, can safely and efficiently undergo MR imaging. Our findings show different patterns of flow alterations depending on the time of MR imaging after ictus, and these findings are consistent with the known pathophysiology of vasospasm. Changes were found in only one patient with SAH, who was examined 0–3 d after ictus, and that patient had only increased rTTP. Among the cases that presented 4–7 d after ictus, 64% had some radiologic manifestation of vasospasm; one had only increased rTTP (Fig 3); one had increased rTTP and diffusion restriction; and six had increased rTTP vasospasm, diffusion restriction, and T2 change. Five of the six late subacute cases with ischemic changes had increased rTTP, diffusion restriction, and T2 changes (Fig 4). Therefore, we have shown the progression from only increased rTTP to increased rTTP and cytotoxic edema (perfusion and diffusion changes) to infarction (as T2 prolongation implies). We have not shown the long-term relevance of these findings, and larger serial studies are required to address that issue. Nonetheless, investigating vasospasm in cases of SAH is a justifiable goal, because a variety of therapies might be expected to improve outcome if the perfusion abnormalities are detected early. The lack of perfusion and/or diffusion abnormalities in cases of acute SAH emphasizes the need for rapid diagnosis of SAH and detection of the cause so that surgery can be performed. Images in patient 22, 6 d after SAH. A, Hemorrhage is visible on this CT scan of the left sylvian fissure and perimesencephalic cisterns. B, Spin-echo T1-weighted (501/16 [TR/TE[) MR image shows a high-signal-intensity change, due to T1 shortening, in the hemorrhage. C, Diffusion-weighted image shows no abnormality. D, Cerebral perfusion is reduced, as shown by increased time to peak in the left hemisphere on this map. Images in patient 26, who presented 8 d after SAH. A, CT scan shows a subtle finding of isoattenuating material (arrow) in the suprasellar cistern. B, Axial fluid-attenuated inversion recovery (6000/96/1800) MR image shows extensive SAH as areas of high signal intensity in the suprasellar cistern and left sylvian fissure. C, T2-weighted (3096/80 [TR/TE]) MR image shows areas of abnormal high signal intensity around the left insular cortex. D, Diffusion-weighted MR image shows areas of high signal intensity due to infarction. E, ADC map also shows that this finding is due to infarction. F, Time-to-peak map from the perfusion-weighted MR sequence shows reduced perfusion in the entire left hemisphere. This work highlights two important points in the treatment of patients with SAH. The first is a restatement of a vital practical point that clinicians outside of neuroscience frequently do not appreciate; CT cannot be used to exclude SAH with 100% certainty, and it is rather poor at depicting SAH after the first 5 d after ictus. Therefore, a patient who has undergone CT for possible SAH must undergo another investigation if the CT results are negative. Historically, this investigation has been examination of the CSF, but MR imaging provides a good noninvasive alternative, particularly for cases of SAH that present late. The second point is the need to transfer patients with SAH and conditions that are of good grade to specialty centers as soon as possible. We have shown that alterations of cerebral blood flow and ischemia are rare in patients with SAH lasting less than 4 d. Timely referral provides the best chance of detecting and treating the source of the hemorrhage before oligemia or ischemia occurs. In summary, we have shown that multimodality MR imaging provides a wide range of information regarding the vascular status of patients with SAH, that MR imaging can be safely performed, and that it can provide extra information compared with that obtained at CT. Specifically, we have shown that patients with SAH commonly have findings that are indicators of reduced cerebral blood flow and ischemia and/or infarction before any surgical intervention. The frequency of blood flow defects is a function of time; defects are uncommon 0–3 d after ictus, and the frequency increases to more than 80% in cases that present at 8 d or later. MR imaging is not presently a standard part of the diagnostic workup for patients with SAH because of the logistical problems of performing MR imaging as opposed to CT. However, improvements in clinical outcome with the introduction of MR imaging in patients with SAH must be shown before general recommendations can be made. We did not assess this improvement in our study because the method must be developed first. The combined efforts of several centers are likely to be required to investigate improvements in clinical outcome. 1 Address reprint requests to P.D. Griffiths, PhD, Section of Academic Radiology, Floor C, Royal Hallamshire Hospital, Glossop Road, Sheffield S10 2JF, England.